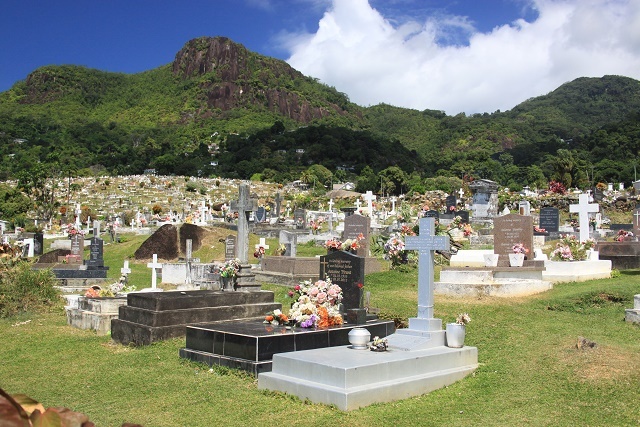 (Seychelles News Agency) - Nov. 2 is the day when Christians commemorates All Souls Day when holy souls are remembered. 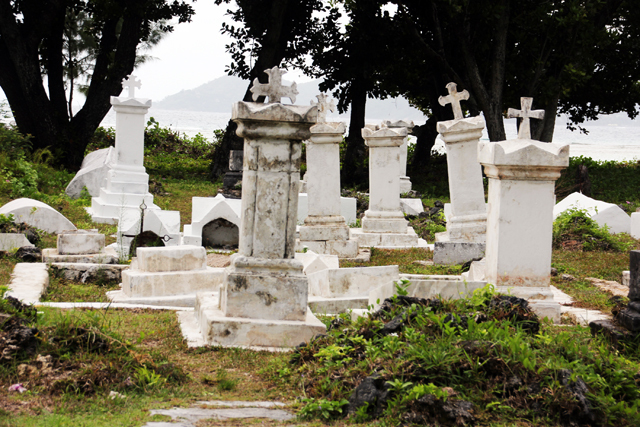 In Seychelles – an archipelago of 115 islands in the western Indian Ocean – all cemeteries come alive on Nov. 2 as families and relatives clean, paint and put fresh flowers on graves of their loved ones. This week SNA brings you six interesting facts about sacred burial sites of the islands. 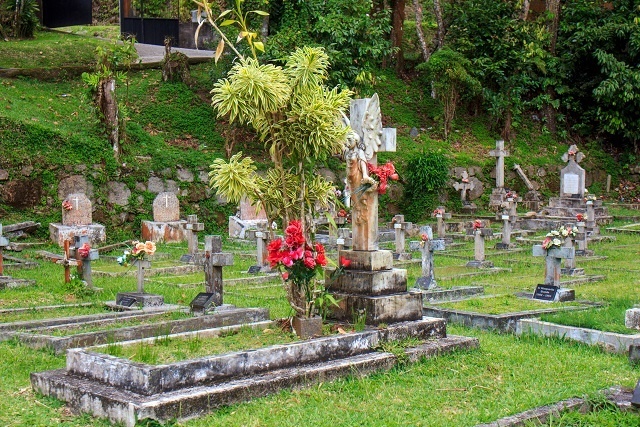 Mont Fleuri cemetery – the largest burial site in Seychelles. The Mont Fleuri cemetery was opened in 1875. Amongst the thousands buried there is Princess Reshia, one of the wives of the ex-sultan of Perak, Abdullah Jaafar Moratham Shah, who was sent into exile in Seychelles in 1877. In March 1891, a portion of the cemetery was declared a Muslim burial ground for the interment of the princess. Forty-eight graves of members of the Seychelles carrier corps who took part in the First World War are also found at the cemetery. On its eastern side, there is a war cenotaph. It is inscribed with 289 names of young Seychellois men who died in East Africa during the First World War and whose bodies were never brought home. Beauvoir Cemetery – resting place for the Roman Catholic missionaries. In the register, it is called Rivière Sèche cemetery, named after a river that flows down to Grand Anse. Located at La Misere – in the west of the main island on Mahe - the cemetery opened in 1873 for the burial of a 37-year-old Irish nun, Sister St François Xavier. This was 10 years after the capuchins of Savoy arrived in Seychelles to take charge of the Catholic mission. The first two Seychellois priests, James Changtave and Symphorien Morel are also buried here. A sprightly little angel perched on one side of the masonry cross reminds us of the resting place of Father Theophile Dumas, whose death in April 1925 is still a controversy to date. Located within the grounds of State House, right in the heart of Victoria – the capital city – the cemetery is the final resting place of notable persons who had played important role in the development of the island nation. These include the Chevalier Queau de Quincy laid to rest in a sepulchre on a site which, during L’Etablissement du Roi was known as Montagne du Pavillon – the actual site where the French flag was raised for the first time on August 1, 1791. 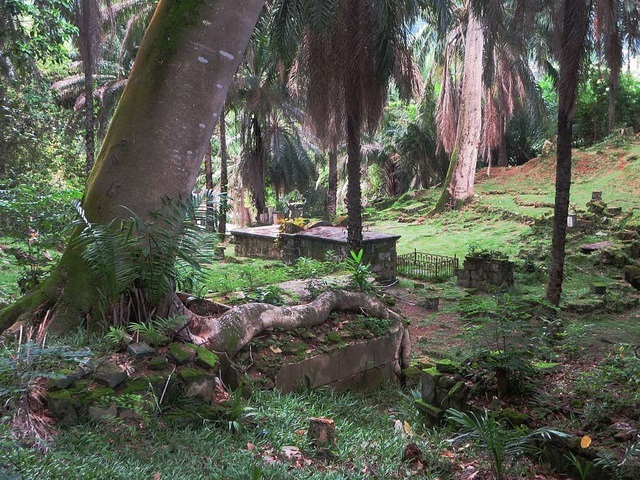 The chief civil commissioner Captain Francis Blunt as well as Sir James Mancham, the first president of the Seychelles who passed away in 2017, are also interred in this cemetery. L’Union cemetery on La Digue. Right in the entrance of the L’Union Estate is an old cemetery which is the final resting place of some of the very first settlers on the island including the Mellon, Laporte, Payet and Camille families which arrived there in the early 1800s. The first inhabitants arrived in 1798, exiled from Bourbon – today Reunion Island, a French department in the Indian Ocean - for taking part in a political rebellion there. 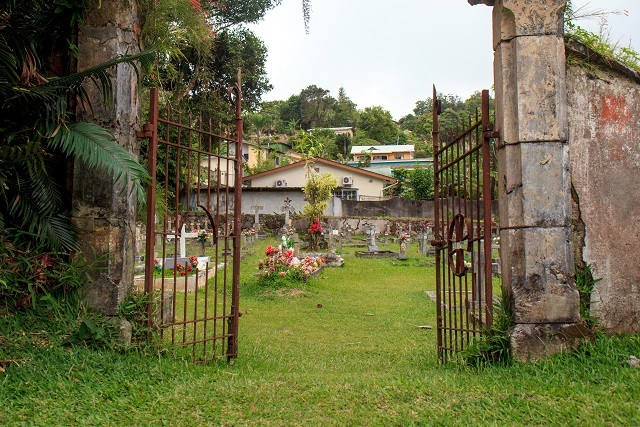 Opened in the late 1780s by the French settlers who created the L’Etablissement du Roi on Mahe in 1778, the cemetery is home to several vaults, including those of the first French inhabitants. Among them are Jean Corsair François Hodoul, Reiny Jean d'Argent, and the mysterious Pierre-Louis Poiret, presumed son of King Louis XVI who fled the French Revolution which started in 1789. 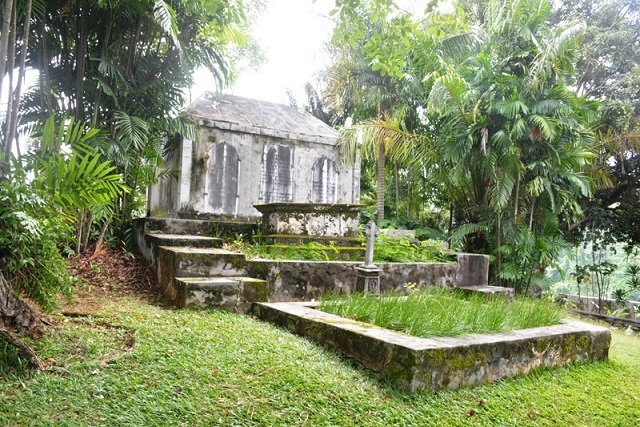 The Bel Air cemetery has a legend that has been immortalised by Creole folklore. Yes, the “Giant boy” who at the time of his death in the 1870s was 14 years old and measured nine feet six inches tall! On all the islands there are burial sites for inhabitants of the islands as well as for seafarers, whose vessel shipwrecked. In other cases, pirates searching the islands for burial sites for their treasures have ended up being buried there. Silhouette island is rumoured to be the resting place of several Arab seafarers, leading to one of the beaches being named ‘Anse Lascars’, the Creole name referring to Arabs. Other burial sites include the Calais cemetery on Cerf island, the Laprude cemetery on Cousin Island, the Lemarchand cemetery on St Anne island and there is an unnamed cemetery on Remire island. 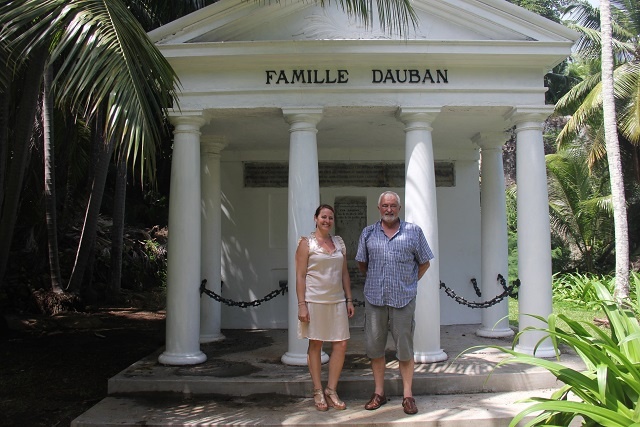 Mausoleums and cemeteries can also be found on private properties such as the Dauban mausoleum of members of the Dauban family who once owned Silhouette. In some instance, the burial sites are no more such as the case of the one on Ile Picard -- Aldabra, which due to degradation and erosion was washed away.